The Screen Printing Frame to compare the old one, new self-stretching frame much simple and does not need glues. Any combination can be into any size of screen frame according to needs and repeated use, product of screen printing would be installed repeatedly, assemble stretching of an arbitrary size of screen frame only needs 3-5 minutes, after tensioning-frame stretch the frame just like the traditional metal or wooden frame you also can put emulsion print and printing. New Assemble self-stretching frame installation requires only two Allen wrench (also can be equipped with electric screwdriver install faster and more efficient), stretched screen frame and ordinary frame without any difference. 2.The tension equality between the edge, each edge according to the allocated length 2-4 tension point, through to rally the uniform operation completely to enable the screen tension and requirements. 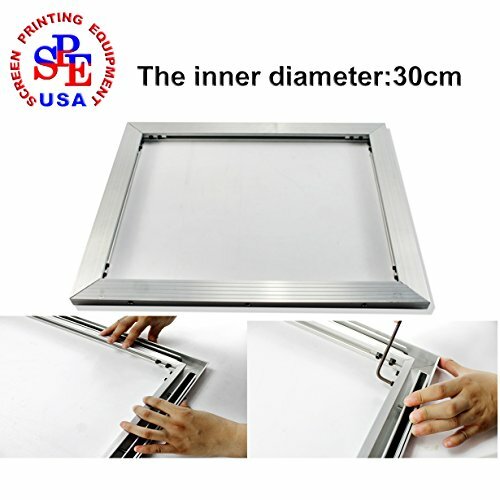 3.we can use the frame to make plate ,print just like using the traditional metal or wood frame you also can put emulsion print，and use Screen Drying Cabinet machine and printing. 4.The repeated use of the finished silk screen mesh (main monochrome), the frame only need a set of stretch clamp, and it can finish stretching screen mesh. 5.the screen frame edge can be order size, what kinds of different size frame strips can be composed of various sizes of the screen frame, can adapt to the size of the various patterns of different screen frame need if. If you have any questions about this product by Aluminum Screen Printing Frame, contact us by completing and submitting the form below. If you are looking for a specif part number, please include it with your message.